This veterinary detective story was written by Dr. Carolyn Orr of the Animal Clinic of East Avenue in Brockport, New York. It is a companion to our story, Eulogy for a Lost Dog, which tells the tale of Shiloh, a young dog who died of Galerina mushroom poisoning. Here Dr. Orr tells the same tale from a rather more technical, veterinary perspective, revealing the sleuthing behind this perplexing case. Shiloh was a 13 month old female, spayed Great Pyrenees; one of our patients. On Monday morning we were informed that she had presented to a local emergency clinic the previous day with vomiting and icterus (jaundice). Shiloh was a healthy young dog showing a normal growth rate. She had undergone routine anesthesia for an ovarian hysterectomy at six months of age with no unusual complications, and had received all scheduled vaccinations (including that for Leptospirosis: four-way from Fort Dodge) and routine antiparasitic medications as a puppy, including heartworm prevention. One complicating factor to diagnosis was that she had gotten a bit finicky about her diet during the two months prior to this incident, but she showed no other clinical symptoms and no weight loss. On Monday morning, the emergency clinician reported Shiloh as stable, but indicated that she had experienced two episodes of vomiting on Sunday, plus severe jaundice. Shiloh ate while hospitalized Sunday night and had stopped vomiting. Monday morning, the emergency clinician believed she was fit to return home, but recommended she be transferred first to me for examination. When Shiloh presented at our clinic at about noon, her condition had worsened notably from her discharge condition just hours earlier. She had been described as energetic and playful on Saturday, had vomited only once Saturday night, with progressive inappetance and more vomiting Sunday. On presentation on Monday, she was barely able to support her own weight for more than 2-3 minutes, yet still wagged her tail in acknowledgment and greeting. Records from the emergency clinic showed a normal examination on Sunday, except for the icterus (temperature of 101.7 degrees F, heart rate 96 bpm, respiratory rate 36 bpm). Shiloh was comfortable on abdominal palpation and showed pink but icteric mucous membranes. Blood work revealed slightly elevated HCT 50%, WBC 16,600 with normal distribution; blood chemistry is shown in Table 1. A leptospirosis titer (7 serovars) had been sent off for evaluation to Cornell University’s Veterinary Clinic/Lab but results would take 3-5 days. She had been started on ampicillin (an antibiotic effective against leptospirosis) and famotidine (an H2 blocker antihistamine useful in cases of stomach irritation) and Normsol IV fluids. The report indicated that she had not eaten anything further after Sunday night. At approximately noon on Monday (approximately twelve hours later), Shiloh presented to our clinic. She was weak and lethargic with moderate and variable pulses, notably icteric sclera, roof of mouth and skin. This was very different from her description upon discharge from the emergency clinic. She was notably not pale on her mucous membranes. Her temperature was 100.4 degrees F, heart rate 116 bpm, respiratory rate 28 bpm. We hospitalized her, resumed injectable antibiotic and repeated blood work (see Table 1). Her initial blood work (Sunday night) had many values that were within normal levels, but that showed potential abnormalities upon closer analysis. Her repeat blood work showed deterioration consistent with her clinical presentation, and with more dramatic changes than common diagnoses such as hepatitis, cholangiohepatitis, cholestasis, or liver toxins more routinely observed in dogs. Blood chemistry is shown in Table 1; however, Alb, GGT, and Crea could not be determined due to the high level of icterus (see Wikipedia’s discussion of liver function tests for more insight, or Vet Tech’s brief explanation of Blood Test Results). IV fluids were continued with added dextrose, antibiotics, H2 blockers, and Vitamin K injectable. I further ordered an ultrasound to rule out gall bladder obstruction—problems with the gall bladder can often be associated with vomiting and jaundice. However, the ultrasound was normal with only note of a mild coarseness to the liver in general but otherwise normal echogenicity and borders. No other abnormalities were observed on ultrasound. At this time I felt we had ruled out numerous problems but still had no control over the disease process. I discussed many potential toxins with the clients, but they had not observed any definite ingestions. The highest likelihood diagnosis on our list other than a toxin was leptospirosis, a bacterial disease that might be consistent with Shiloh’s symptoms. We have experienced occasional cases caused by the uncommon (in dogs) serovars Leptospira autumnalis and Leptospira bratislava in the recent past in the area. I indicated my concern to the client with Shiloh’s rapid and progressive deterioration, especially the deterioration of functions like glucose production and low BUN levels. If we supported the diagnosis of leptospirosis I would not expect clinical improvement for another 24+ hours from antibiotic therapy and gave a very guarded prognosis. Unfortunately, she continued to deteriorate quickly and fell into semi-consciousness with head tremors, lateral recumbancy, poor responsiveness with eyes rotated caudally except with stimulus. She continued to be very icteric with developing signs of petechiation of ventral abdomen, mild ascites, hypothermia, poor thready pulses, and tachycardia. At this time, our clients made the difficult decision to euthanize Shiloh due to her rapid deterioration, progression to neurologic signs and poor prognosis for recovery. I requested a gross necropsy and pathology of liver and kidneys for the potential better understanding of Shiloh’s acute illness and death. Shiloh had gone from a normal liver (blood work at 6 months was normal) to acute liver failure in 36-48 hours. Leptospirosis was still highest on the list of differentials. It occurred to me that the titer drawn on Sunday would most probably be negative because Shiloh would not have had time to seroconvert (develop antibodies) if she had recently acquired the infection. Therefore I sent a sample of the liver to Cornell for a leptospirosis fluorescent antibody test. I also saved a small sample of the liver for possible toxicology testing, and sent a sample of liver and kidney to a pathologist for evaluation. Leptospirosis titers later came back negative, and the fluorescent antibody test was also negative. Leptospirosis was not the cause of Shiloh’s rapid decline. Liver pathology confirmed that liver failure was due to severe hepatic necrosis of a type that could be caused by amatoxin-containing mushrooms. Some mild renal (kidney) changes were also observed that might have arisen due to recent acute dehydration, but which were also consistent with mushroom poisoning. One determining observation was the lack of the fatty liver changes that had been seen with aflatoxin cases due to dogfood contamination in 2005. We could rule out aflatoxins as a cause. The highest causation of the pathological findings was mushroom toxicosis: the liver histology was consistent with poisoning by mushrooms containing amatoxins. Even though we had no observation of mushroom ingestion, after talking with Ms. Munganast she did remember mushrooms growing in the yard. She had never observed Shiloh eating the mushrooms, but Shiloh had a history of chewing on things. An early attempt to identify the mushrooms from photos suggested they were not toxic. 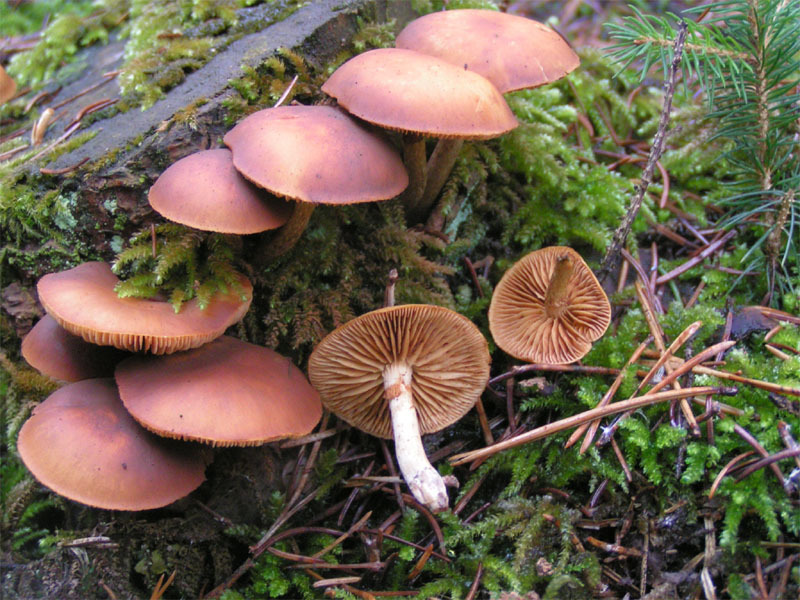 However, later examination at Cornell confirmed the mushrooms were a species of Galerina that tested positive for amatoxins with the Meixner test. Thus we were finally able to determine that the probable cause of Shiloh’s death was mushroom poisoning. 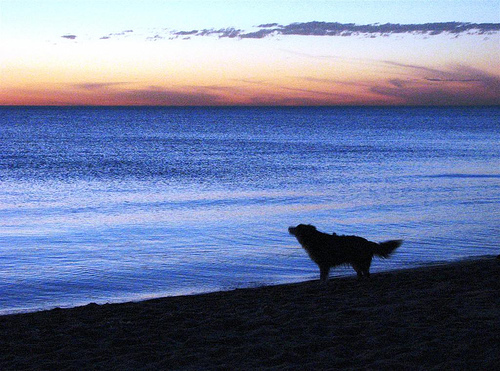 You can find Shiloh’s story, as told by her owner, right here. Editor’s Note: Here’s a short list of references that might be helpful in understanding amatoxin poisoning in dogs. Please leave us a comment if you know of something else useful in these sad cases. The Galerina mushrooms that feature in this story contain amatoxins–the same toxins as found in the destroying angels (Amanita bisporigera and A. virosa) and the death cap (Amanita phalloides). Note that other mushrooms that are poisonous to dogs may contain different toxins, so they cause quite different symptoms than those described here. Aldridge, J.P. 1997. Why dogs eat mushrooms. McIlvainea 13: 20-29. Faulstich H., Fauser U.: 1980, The course of amanita intoxication in beagle dogs. In: Faulstich H., Kommerell B.K., Wieland T., eds Amanita toxins and poisoning. pp. 115-123. Verlag Gerhard Witzstrock, Baden-Baden, Germany. Faulstich H., Talas A., Wellhoner H.H. : 1985, Toxicokinetics of labeled amatoxins in the dog. Arch Toxicol 56:190-194. Tegzes J.H., Puschner B.: 2002. Amanita mushroom poisoning: efficacy of aggressive treatment of two dogs. Vet Hum Toxicol 44:96-99. Tyler, V.E., Jr., R.G. Benedict, L.R. Brady and J.E. Robbers. 1966. Occurrence of Amanita toxins in American collections of deadly Amanitas. J Pharm Sci 55:590-593. Wieland, T. 1983. The toxic peptides from Amanita mushrooms. Int J Peptide Protein Res 22:257-276. We thank Flickr user Jessica Rabbit for permission to use her lovely photo to illustrate our story. Please note that it is protected by a Creative Commons license. 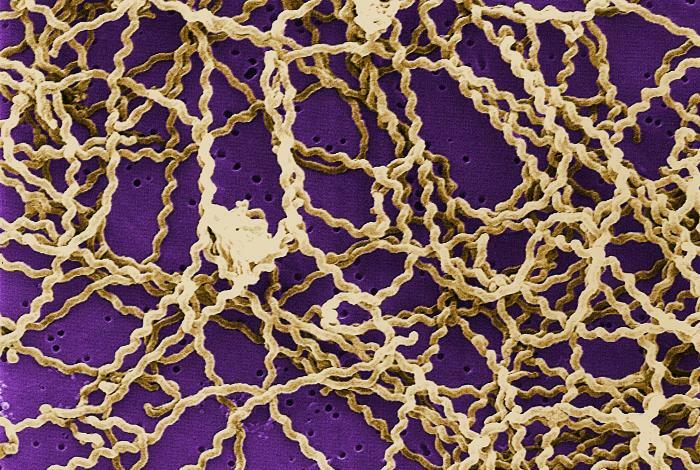 The Leptospira image was taken from Wikimedia Commons, and is in the public domain thanks to investigators at the Centers for Disease Control and Prevention. The Galerina marginata mushroom image was taken from Wikimedia Commons as well. It was provided by Eric Steinert under a GNU free documentation license. A mushroom similar to this one was likely the cause of Shiloh’s death. Thank you for your detailed report and pictures. The Euology for a lost dog alarmed me and scared me. Molly, a black Labrador Retiever through our wooded area. Most of the time I let her of the leash, but now I’ll watch her more closely. Great post.. Long but interesting.. Now I get to hate mushrooms because of the dog victim.. Dunno why..